The 2018 Ford Mustang GT starts at $35,190, but when optioned up the price tag can rise to $53,000. That’s a lot of money, but then the Mustang GT does offer 460 horsepower. The question is, should you purchase a we’ll optioned GT for that price? For $53,000 you get into the price range of a few different high performance cars. For $55,300 you can step up to a base Porsche 718 Cayman. It may only have a turbocharged flat-four that pumps out 300 horsepower, but it handles better than just about any other car. It simply can’t match the Mustang’s under 4 seconds 0-60 mph time, but at 4.9 seconds it isn’t exactly slow. What the Cayman has over the Mustang is, a better ride, better build quality, better interior materials and a badge that is arguably more impressive. But perhaps a European sports car isn’t your thing. If you want an American sports car, the Chevrolet Corvette Stingray starts at $55,495. The ‘Vette also can be had with 460 horsepower and can hit 0-60 mph in just 3.7 seconds. The styling is also arguably better as is the interior. So, is the Mustang GT worth $53,000? The answer is yes, but there are other options that you would also want to look into once you get up to that price range. The big difference is you get a base model of many of the other options or a fully loaded Ford Mustang GT. Our recommendation if you have about $55,000 to use on a sports car is to test drive plenty of options and decide what you want to live with. The latest ‘Stang is a very good car with an intoxicating exhaust note and much of the decision depends on what you like. 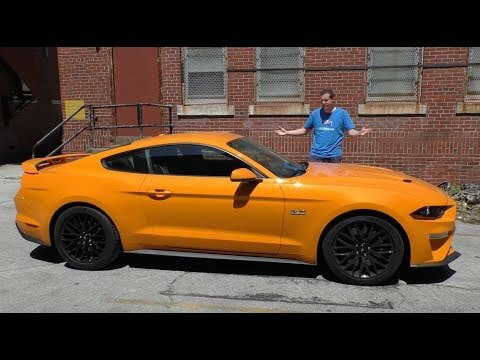 Check out the below video showing a review of the Mustang GT and then scroll down to the comments and let us know if you would pay $53,000 for a 2018 Ford Mustang GT.